Daterly is a social network for singles. Offering a newsfeed on a dating site is a departure from the traditional dating sites that all seem to run on the same old formula. 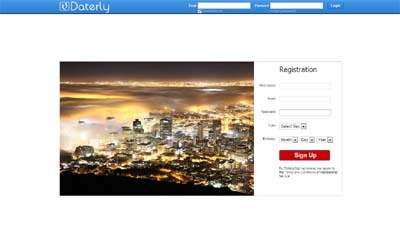 On Daterly you can upload photos, share Youtube videos, make posts and comments, much like you do on Facebook. Daterly provides you with the tools to express yourself through sharing your tastes and experiences on an ongoing basis, thus creating your online social resume. Discover who shares your interests, connect to follow their posts in your news feed. Find out what she is reading or where she ate last night, what he likes to do on his day off or what movie he went to see recently. Matching a potential partner with a mathematical equation will never produce meaningful results. Sharing what you do on a daily basis, what game you watched over the weekend, what music you are listening to right now, sharing what you just read, whats in the news, what restaurant you ate at last night or where you met your friends for drinks. All these activities describe your lifestyle and the type of person you are. You will have plenty in common and lots to talk about on your first date. The key feature on Daterly is being able to connect and share with other site users, much in the same way you do on Twitter, once you have connected with a user, their posts appear in your news feed on your home page. You can then add a Connection to a subgroup, where you can select hotlist, follow, friend or just leave them in the default group connections. This is a great way to get to know someone by following their posts and commenting on updates and photos, but without the expectations, pressure and possible disappointment that might come when hotlisting or favouriting someone on a conventional dating site.